Probably one of the biggest and most controversial news stories in the US sporting world today is: Does Tom Brady deserve it? We have all heard about “Deflate Gate” whether we wanted to or not but in the land of the free and home of the brave, American football is something we just cannot ignore. The NFL requires footballs to be inflated to 16lbs of pressure per square inch (psi), but Tom Brady prefers his balls around 12.5 psi because they are lighter to throw and easier to grip. During the AFC championship game–the deciding factor of who would advance to the Super Bowl–it was found that the Patriots’ balls were well below the standard. Of course, this called for an investigation, but it didn’t stop the Patriots from advancing to their Super Bowl win. After a thorough investigation, text messages were leaked (solid evidence in today’s technological world). While two employees blatantly admitted to tampering with the balls, texts from Brady were unclear on the issue. Investigators did, however, link Brady to a 13-minute call with one of the employees on the morning of the AFC championship game. This gave the NFL probable cause to believe that he knew, although he denied it in a press conference with the media. The two employees who tampered the balls will be indefinitely suspended from the NFL. A 4-game suspension for Brady, one is against the Cowboys, a highly-anticipated game. The loss of some very important draft picks (1st round in 2016, 4th round in 2017). 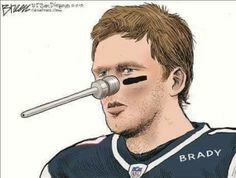 While many argue that the punishment for Tom is too harsh given that the evidence is not concrete, others say that it is far too light because he is a role model and he cheated his way to the Super Bowl while lying to millions of fans who look up to him. With his legacy at risk, Brady plans to appeal the decision. But the whole situation begs the question: Does “guilt by association” matter?, If he definitely knew the balls were underinflated, whether he specified for it or not, and lied to the media saying he was completely unaware, what is an appropriate punishment?